First Line: "All in all," Mr. Granger said, "the scores on the midterm were pretty good, so I didn't feel the need to grade on a curve." 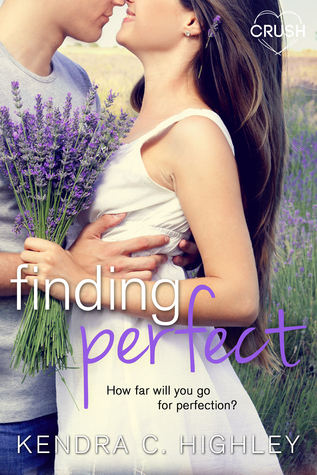 Review: What made me want to read Finding Perfect was the whole make-over of the guy for a change. All too often we see the girl changing her outward appearance etc. to get attention, in Finding Perfect it was the guy which made it a bit more interesting. Ben and Paige are both incredibly smart students, but Paige has been struggling with one of her classes so Ben agrees to help her out under one condition that Paige helps him get the girl of his dream, her best friend. Of course you already know how books like these go, eventually Ben realizes that Paige is more his type and falls for her hard and it was just all so cute, the romance was innocent and sweet and it was fun seeing the two eventually figure things out. Besides the romance, there was Paige having to deal with figuring out what she wanted to do vs what others wanted her to do. She was trying to follow in her father's footsteps of becoming a neurologist to make him proud but deep down she knew it wasn't something she wanted so there was a little bit of drama with her parents. I was rooting for her the whole time even with how short of a book Finding Perfect is Highley did a great job developing the characters to where I connected with them both very easily. Overall Finding Perfect is great if you're looking for a light adorable romance, maybe as an in-between book after an intense read. ~"Love that's too easy isn't worth much. It's better when there's some work involved."